Kids' swim shorts, red tropical leaf print on navy blue background. Cut mid-thigh. Elastic waist with navy blue drawcord. Europann crest on the left leg. Two side pockets and a back pocket with zipper. 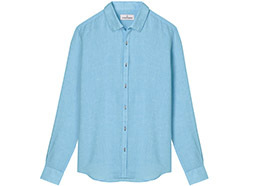 Fabric resistant to sea water, sun and chlorine and dries quickly. Kids' swim shorts, blue tropical leaf print on navy blue background. Cut mid-thigh. Elastic waist with navy blue drawcord. Europann crest on the left leg. Two side pockets and a back pocket with zipper. Fabric resistant to sea water, sun and chlorine and dries quickly. This swim short with Palmers print dive you directly on summer, Noah is ideal for the summer period. Slim fit mid-length short. Marine elasticated drawstring waist. Europann badge on left leg. Two front slash pockets and back zipped pocket. They're resistant to sun, salty water and chlorine. Quick-drying. Come with a white waterproof bag. This surf waves print is a original model for the summer. Surf lovers, Alex swimshort is for you ! Slim fit mid-length short. Marine elasticated drawstring waist. Europann badge on left leg. Two front slash pockets and back zipped pocket. They're resistant to sun, salty water and chlorine. Quick-drying. Come with a white waterproof bag. 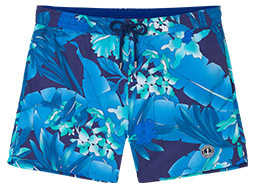 Ideally wear by the sea , this swim short with Tropical flowers print will fill you all the summer. Slim fit mid-length short. Marine elasticated drawstring waist. Europann badge on left leg. Two front slash pockets and back zipped pocket. They're resistant to sun, salty water and chlorine. Quick-drying. Come with a white waterproof bag. Kids men swim shorts with toucan print, ideal for summr. Slim fit mid-length short. Yellow elasticated drawstring waist. Europann badge on left leg. Two front slash pockets and back zipped pocket. They're resistant to sun, salty water and chlorine. Quick-drying. Come with a white waterproof bag. Men swim shorts with vintage print , ideal for the summer. Slim fit mid-length short. Red elasticated drawstring waist. Europann badge on left leg. Two front slash pockets and back zipped pocket. They're resistant to sun, salty water and chlorine. Quick-drying. Come with a white waterproof bag. Men swim shorts with white graphic print. Manufactued with italian tissues, Joey gives a class and sober touch to swimwear outfit. Slim fit mid-length short. Elasticated waist. Europann badge on left leg. Two front slash pockets and back zipped pocket. They're resistant to sun, salty water and chlorine. Quick-drying. Come with a white waterproof bag. Be different with this swim shorts with Pantone print. This quality italien product will give you a unique style. Slim fit mid-length short. Fushia elasticated drawstring waist. Europann badge on left leg. Two front slash pockets and back zipped pocket. They're resistant to sun, salty water and chlorine. Quick-drying. Come with a white waterproof bag.